sportsmatrix » Can the Riches of the Premier League Help the Promoted Clubs Survive? On the same day as the most prestigious game in club football takes place – the UEFA Champions League Final – the game often billed as being the world’s single most valuable football game will take place at Wembley Stadium, when Hull City and Sheffield Wednesday battle out the Championship playoff final for the right to join Burnley and Middlesbrough in next season’s Premier League. The financial rewards for the promoted clubs are expected to exceed £200 million, much of it thanks to the massive television deals that have made the English Premier League the world’s richest league. For a Championship club, even one that has been well run, this financial windfall provides an opportunity to take the club to an entirely new level and to attract players who once would have been out of reach. Despite these financial riches there is a salutary lesson to be learned from the fate of a number of former Premier League clubs that overstretched their resources and are now a long way from the riches of the Premier League. 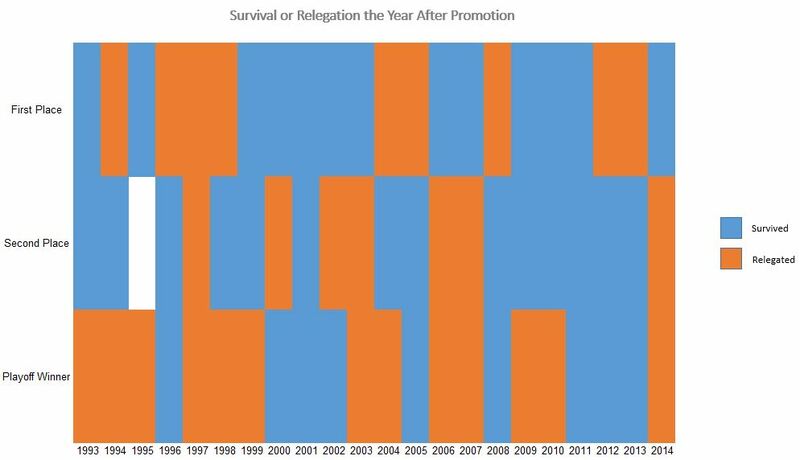 Winning promotion through the playoffs is both tortuous and nerve wracking for all those involved; but what sort of effect does it ultimately have on the promoted club, both in the short and long term and how do teams promoted through the playoffs fare compared to those teams that gained automatic promotion? SportsMatrix had a look back over 22 playoff finals dating back to the start of the Premier League era in order to see what happened to both the playoff winner and loser during the next season, after two seasons and again after five seasons, as well as looking at the prospects for those teams who were automatically promoted to the Premier League. In 2012-13 Leicester City lost a dramatic playoff semi-final against Watford before going on to win the Championship the following season by nine points and a massive 17 points more than third placed Derby County. Leicester survived their first season in the Premier League after looking certs to be relegated at the start of 2015, yet unbelievably one season later have run away with the Premier League title, something which will surely act as motivation to every promoted club. * At the end of the 1994/95 season the Premier League was reduced from 22 to 20 clubs, with two teams promoted from Division 1 (Championship) and four relegated from the Premier League; with second placed Reading losing out in the playoff to third placed Bolton Wanderers. * In total, 36 different teams have been promoted since the inception of the Premier League. 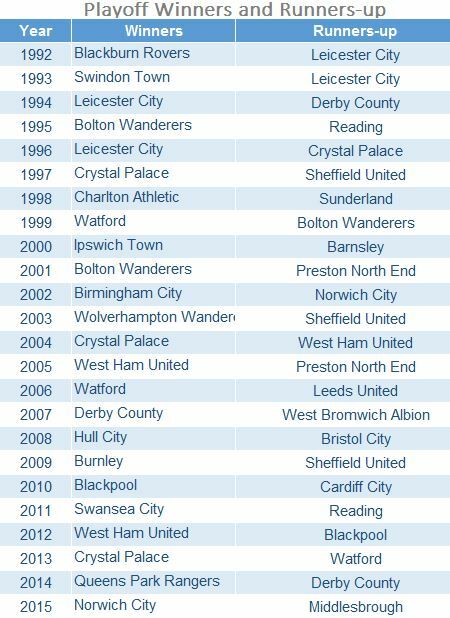 SportsMatrix looked to see how the 65 clubs which gained promotion from the Championship/Division 1 between 1992/93 and 2013/14 fared after being promoted to the Premier League. Seasons 2014-15/2015-16 have been excluded because SportsMatrix wanted to examine how promoted teams fared after more than a single season in the Premier League. The purpose of this report was to see how teams fared in each of the five seasons following promotion and to discover whether being promoted automatically gave them a better chance of Premier League survival than being promoted through the playoffs. In addition we wanted to see how the playoff losers fared in subsequent seasons. In the long term does it really matter whether a team wins or loses in the playoff final? At the end of Saturday’s playoff final the emotions of the winner and losers will not be more different. The heartbreak of the losing finalists after nine months of tough Championship football in stark contrast to the unbridled joy of the winners. However taking a step back, statistically what are the long term prospects of winner and loser from the playoff? 41% of the teams promoted to the Premier League via the playoffs successfully avoided relegation back to the Championship the following season. At the end of the fifth season following promotion through the playoffs, seven of the 19 playoff winners (37%) were in a higher league than the team that they beat. Five years after winning a playoff final, 32% of winning teams were in the Premier League, although in some cases there were teams which suffered subsequent relegation and then promotion. Only four out of 22 playoff winners (Leicester City 1996, Bolton Wanderers 2001, West Ham United 2005 and Swansea City 2011) managed to retain Premier League status for five consecutive seasons. 27% of those teams losing in the playoff final were promoted in the following season. Four (21%) of the losing playoff finalists found themselves in a higher league than the team that beat them five years previously. Five years after losing in the playoff final 32% of losers found themselves in the Premier League, exactly the same percentage as the winning teams. This data should provide some solace to Saturday’s losing finalist that in five years’ time they statistically have an equal chance as the playoff winner of being in the Premier League. What is the likelihood of promoted clubs surviving in the Premier League? The probability of relegation from the Premier League for promoted clubs is highest in their first season after promotion, decreases slightly in the second season and falls significantly after the second season. Based on this data the so called second season syndrome appears to be a myth, with only nine of 35 teams (26%) relegated during their second season in the Premier League. Ending the first season in the Premier League in 17th place is generally the aim of every promoted team, with a higher placed finish regarded as being a bonus. Once a team survives its first season it then has the financial boost gained from being a Premier League club, plus a year’s experience against the best teams in the country; nevertheless the target of reaching 40 points, as pointed out by Leicester City manager Claudio Ranieri, continues to be the target. For every promoted club first season survival is the biggest challenge; but does it matter if the promoted club ended the previous campaign in first or second place or gained promotion through the playoffs? How do promoted clubs fare in the first season? 2001 (Fulham, Blackburn Rovers, Bolton Wanderers) and 2011 (Queens Park Rangers, Norwich City, Swansea City) are the only seasons in which the three promoted clubs survived their first season in the Premier League. 1997 (Barnsley, Bolton Wanderers, Crystal Palace) is to date the only season which saw all three promoted clubs from the previous season relegated the following season. Since the turn of the millennium there has been a decrease in the probability of promoted teams automatically being relegated after one season in the Premier League. Perhaps linked to the ever increasing television deals between the Premier League and the television companies. In the first seven seasons of playoffs, six of the seven playoff winners (1993-1999) were automatically relegated the following season. In the 15 subsequent seasons (2000-2014), only seven teams winning promotion via the playoffs were relegated the next season. Between 2000-2003 and more especially 2008-2013, most of the promoted teams successfully avoided relegation in their first season in the Premier League. Does the final position for a promoted club influence Premier League survival in future seasons? Does winning the Championship improve the likelihood of retaining Premier League status the following seasons and is the playoff winner the more likely to be relegated? The data reveals that the teams winning promotion automatically have a statistically greater probability of remaining in the Premier League in both the short and long term than the team promoted via the playoff. Perhaps somewhat surprising, the data reveals that the team finishing runners-up in the Championship is statistically less likely to be relegated the following season than the team that won the league, both in the short and the long term. 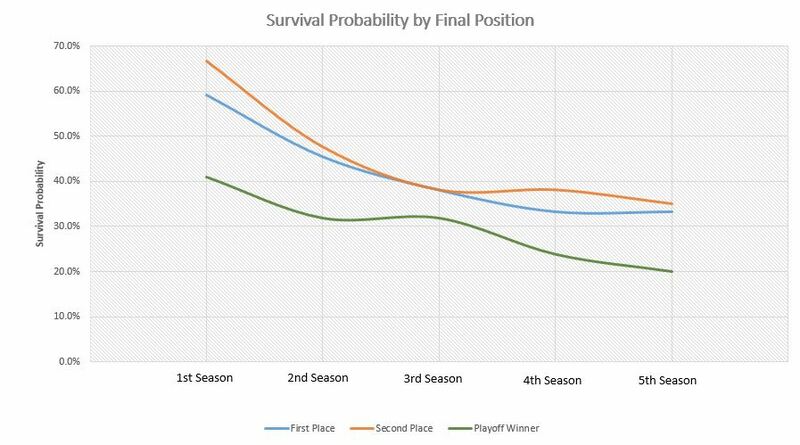 A cautionary tale for the playoff winner, despite the glory of winning the final, the chances of surviving a first season in the Premier League remain relatively slim, especially compared to the clubs promoted automatically. It’s not all bad news for the playoff loser, because five seasons after appearing in the playoff final, they are statistically just as likely to be in the Premier League as the team that beat them in the playoff. The probability of automatically promoted teams not suffering relegation in the first season have improved noticeably in recent years, especially for the team promoted as Championship runners-up. Regardless of the outcome of Saturday’s final, it will be interesting to see how both Hull City and Sheffield Wednesday fare in the coming season and whether either or both can break past trends. For the winning team will the huge financial benefits help them to retain their Premier League status and will Leicester City’s success provide all of the promoted clubs with the motivation to aim for more than just survival.